The Texas Historical Commission (THC) accepts historical marker applications each fall for the following calendar year. The next application period will be from September 1 to November 15, 2018, for 2019 markers. 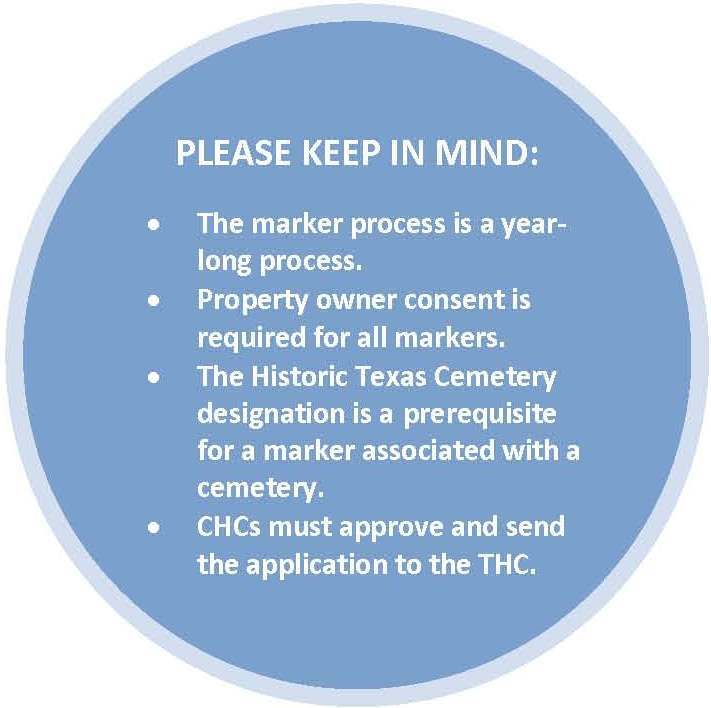 Here are the three major steps to complete a THC historical marker application. *This does not include HTC name & date plaques which may be submitted year-round and do not require a narrative. The first step in the historical marker process is contacting the county historical commission (CHC) in your area. The marker application process begins at the county level with CHCs providing review and comment for all applications. Once approved, CHCs submit completed marker applications to the THC for consideration at the state level. If you are interested in submitting a marker application, it is best to get in touch with your CHC sooner rather than later. At times, CHCs can assist you with research and completing the marker application process, but more importantly, CHCs need time to review your marker application before the THC application deadline. CHCs receive anywhere from one to 30 marker applications each year depending on the size and interest-level of their county. Applications are due to the THC from September 1 - November 15; however, we suggest sending completed applications to the CHC no later than August 15 to allow time for the CHC to review the application and even gather additional documentation when necessary. An even better suggestion would be to contact the CHC in the spring to find out if there is a county-level review timeline for which you should plan. In order for your marker application to be considered complete, an applicant must contact the owner of the property where the marker will be placed. Property owner consent is required for all marker applications and an application is not considered complete unless that signature has been secured. Proof of property owner consent is also required in the form of deed records, tax appraisal records, etc. The most important section of a historical marker application is the narrative history. 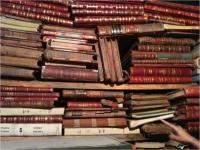 A narrative history is simply a research paper that documents the significance of the property or topic. This research paper must be complete, orderly, concise and fully documented with endnotes or footnotes. Composing narrative histories takes time, so use the 10 months prior to the application deadline to research, document, and write your marker application narrative. THC staff have written several “how-to” guides to help the public with research projects. Guide topics include how to access and use Sanborn Fire Insurance Maps, photographic collections, oral history, and census records, as well as other source materials. We strongly suggest reviewing these guides to help ensure a balanced and well-researched narrative history. We also recommend using multiple types of sources during the course of research and, whenever possible, consulting primary source material. THC Marker "How-to" Guides may be found on the Marker Tools webpage. Some source material is accessible online. Please download our handy website list to view websites that may assist in your research. The THC also created guides to help CHCs and applicants develop a strong narrative history for a historical marker application. These guides cover researching and preparing a narrative history and include a breakdown of each suggested section of the narrative (context, overview, significance, and documentation). They also include a checklist, suggested sources that may be examined, and a sample narrative history. The information will help you prepare a narrative for a variety of topics, including structures (RTHLs), cemeteries, individuals, events, churches, communities, World War II topics, and institutions. To view the guides, visit the Marker Research Guides webpage. Once the research paper with bibliography is complete, you are ready to fill out the application form. Keep in mind that the application form is the easiest part of the process and consists of mainly contact information. This part of the application packet can be saved for last. Since the marker process will take at least a year, be sure to provide contact information that will be active for one to two years. If the contact person or information changes, applicants will need to contact the THC to update the information so that communication can continue throughout the process. Please review the information provided in the table above. Once all pieces of the application packet are ready, submit the packet of information (electronically) to the CHC in which the marker topic is located. Remember that the CHC is required to review and approve the application, so make sure that they receive it weeks (or even months) prior to the application deadline. This is especially true for larger counties, which may have a marker application review committee who meet on designated dates prior to the application deadline. For an outline of the basic steps of the marker application process, please see this marker process flow chart (PDF).